Bungil Shire, an area of 13,338 sq km on the western Darling Downs and generally 420 km north-west of Brisbane, was amalgamated with Roma and Bendemere, Booringa and Waroo Shires in 2008 to form Roma Regional Council. Its administrative headquarters were in Roma, and its main towns were Injune and Muckadilla, north and west of Roma respectively. The New South Wales Surveyor-General, Thomas Mitchell, traversed the Bungil area during his fourth expedition in 1846. Settlement followed a year later, when Allan MacPherson took up the Mount Abundance pastoral run, 7 km north of Roma. MacPherson's attempts to establish a sheep run were plagued, however, by ongoing conflict with local Aborigines. The land was turned instead to sheep grazing, and a homestead constructed by new occupier Stephen Spencer in the early 1860s (listed on the Queensland heritage register). Spencer diversified into agriculture and horticulture, although Mount Abundance only began living up to its name after acquisition by the Scottish Australian Investment Company in the late 1860s. By the mid-1870s, Mount Abundance was regarded as one of Western Queensland's finest grazing properties. The resumption of pastoral stations in the region through the 1890s brought diversified grazing, crops and dairying. Roma (see separate entry) was the area's first European settlement, which by 1880 was a substantial township and railhead. Roma began as a crossing place on Bungil Creek, and it is thought Bungil was derived from an Aboriginal expression describing grass and water. The Bungil local-government division was established in 1880. In 1911 an eastern portion of the shire was severed for the creation of Bendemere Shire. Closer-settlement schemes after World War I resulted in further settlement to the north, around Injune, and a railway line from Roma to Injune opened in 1920. The area's growth was frustrated, however, by small farm blocks and severe prickly pear infestation north and east of Roma. One of the many soldier-settler dairy farmers at Injune was the author Frank Dalby Davison. His experiences are recounted in Owen Webster's Outward Journey (1978). Despite numerous farm failures, Injune grew to be the Bungil Shire's main township with postwar populations between 320 and 470. It was gazetted as a town in 1922 and was named after Injune Creek, the name probably having been derived from an Aboriginal word describing the sugar glider. In addition to grazing, Injune has been a coal-mining area (1933-63) and is also a sawmilling district, relying chiefly on cypress, which is milled at the town's two sawmills. Injune has golf, swimming and bowling facilities, a racecourse, health service, an airport, retirement village, local shops, a tourist information centre and a State primary-secondary school (1921). The railway line closed in 1967. In 2015 the Old Injune Coal Mine, 4 km south of Injune, was added to the Maranoa planning scheme's historic and cultural places register. It features a commemorative plaque and a metal sculpture representing a miner at work. 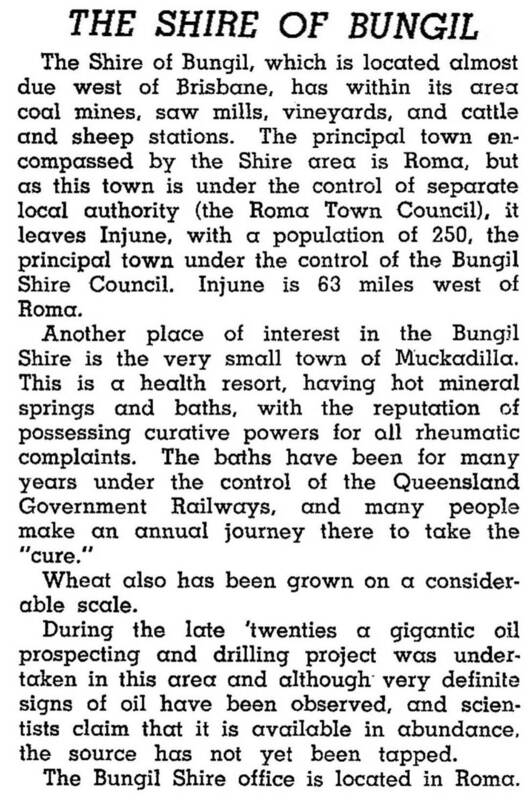 The shire had a cooperative relationship with the Roma town council through a jointly run stores-cattle sale yard (1969). The centrally situated Roma offered a full range of facilities, but the shire provided library and swimming facilities in Injune. In 2005 the Spring Gully coal methane gas mine in the north of the shire was opened by Origin Energy. * After severance of Bendemere Shire.